So we have shown you all how we developed the Soakboxes, and how to knit them, but what about the in between? We thought we would show you how the individual boxes get made. 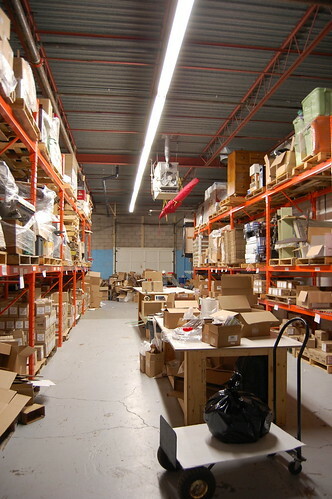 The magic all happens in the warehouse behind our offices. Cameron is our box packing expert. He packs all the orders that go out to our retail shops and online customers. The lower half of the shelves on both sides of the aisles hold skids of Soak, Handmaid and Heel. The boxes are packed on the middle tables, then placed on the dolly to wait to be picked up and sent off to their destinations. First we have to get the yarn from Lorna’s Laces. These four boxes hold enough yarn to make around 800 Soakboxes! When we build the boxes we make lots of these little packs of the bottles first. Then they all get put together into the bigger box with the yarn and pattern. Most of our Soakboxes are shipped out to shops, so lots of our kits get packaged right up into boxes of 12. 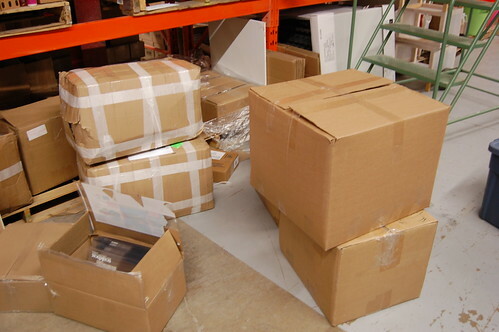 We keep some aside to ship to customers as well. These boxes are all awaiting their new homes. Which one will you be taking home?